Learning an instrument requires discipline. You have to attend the lessons, work hard during them and practice every day. For children that establishes a routine and pattern and it’s been well-established that children, especially younger ones, generally enjoy and accept routines – many even desire them for the structure it puts in their lives. With children of six or seven, music lessons create an atmosphere of learning that can be applied to work in school. Music is very practical learning – they learn and immediately apply each new lesson with their fingers – but you can show and help them use the skills of learning they acquire in their school work. Paying attention during a music lesson is vital, and helping your kids apply that in school can lead not only to increased learning, but better behaviour, as they become less distracted. A problem many parents face is getting their kids to do homework. It can be a nightly battle for some to get their youngsters to buckle down and do the work. 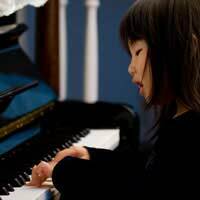 Children who’ve been learning an instrument for a while have developed a culture of taking time to practice and the self-discipline to sit and do it, which translates well to completing homework assignments. Chances are you won’t have to fight with your musical children to make them do homework. Simply work it around their daily practice, so it becomes a nightly ritual. You’ll find that their marks in school will be good, they’ll hand in work that’s generally neat, and they’ll pay attention to detail – all little life lessons picked up from studying music. The fact that music students are used to the discipline and self-discipline of studying means that, in general terms, their behaviour is better. They’ve had experience working one-on-one with a teacher and that sets them apart from many in the class. The best news is that once these habits are inculcated, they tend to stick through both teenage and university life. So by having your child learn an instrument, you’re not only having them accomplish that, you’re also establishing patterns of behaviour that will stand them in good stead for the rest of their lives. You also help establish a mindset where youngsters are used to learning, to taking ideas in quite quickly and using them. That, and the behaviour (which includes lengthy attention spans) are great gifts to pass on to your child, and ones that will enable them to get ahead in life. So when you’re considering whether to start music lessons for your son and daughter, think about the wider implications of it all. It might seem like a little splash, but the ripples can spread very wide.